Been reading over on New Media Age and Adverblog all about Bud Bucks which launched on Feb 8 in the UK. 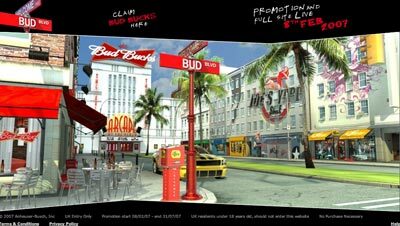 Apparently every time you drink a bud you get a voucher code which you then text off and a reply tells you how many Bud Bucks you got which can range from $5 to $100 (Ã‚Â£2.50-Ã‚Â£50). The actual Bud Bucks website is very slick and really really impressive. It is decked out like a street in America and there are shops you can visit such as a clothes retailer, games arcade and oh yeah, a bar! I had a quick play about in the bar and it is quite addictive. All in all a really good micro-site, but hey, what do we expect from the King of Beers!